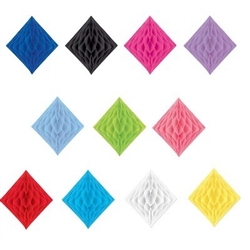 These Tissue Diamond hanging decorations are great for adding color to any party. No matter what the theme is, these are a great addition to any room. They are lightweight and easy to hang anywhere you choose! Whether you are throwing a party or want to add some color to your room or house, these are the perfect decoration for any need. Contains one per package. Each diamond measures 12.5 inches long and 12 inches wide. Choose from one of the many vibrant colors we have to offer! Choose your color from the list above!